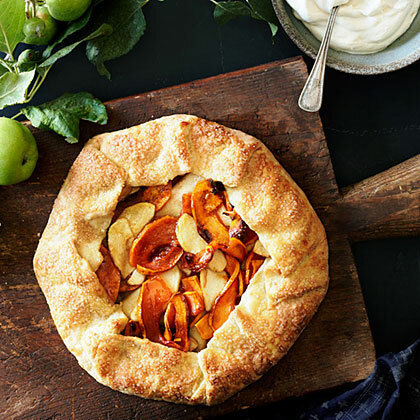 Basically an open-face pie, this galette is a great dessert for pie-phobes to make because the crust is so easy to handle--you don't even need a pie pan. Set dough on lightly floured surface and roll into a large round about 1/8 in. thick. Transfer to a parchment-lined baking sheet and chill until ready to fill. Preheat oven to 375° with a rack on bottom rung. Lay pumpkin slices on a greased baking sheet. Roast, turning once, until tender when pierced, about 10 minutes. Mix apples, spices, salt, flour, both sugars, and bourbon until evenly coated. Add pumpkin and toss just to combine. Pour apple filling into center of dough, leaving a 1 1/2-in. border. Fold edges over fruit, allowing dough to pleat as you go. Dip a pastry brush in water and brush folded edges of dough. Sprinkle edges with coarse sugar. Bake galette until browned and bubbling, about 1 1/4 hours. Let cool before cutting.